Can Theatre Ever Be Apolitical? In short – no. The act of creating and performing a piece of theatre will always be a political act. By standing up and taking space, politics is always there; of course, some theatre is more political than others. It would be frivolous to compare The Cheviot, The Stag and The Black, Black Oil to the likes of Shrek: The Musical in terms of their politics, but I think that it’s important to recognise that both of these productions do create a form of political meaning. For years when I thought of political theatre, I imagined a sombre, preachy piece of theatre spoken by a cast wearing all black shouting at us about the injustice of the world. Theatre like this does exist and arguably there is a place for it, but it’s far from the norm of political theatre. Political theatre can be funny, lively, loud and a ‘good night out!’ Just because it’s political doesn’t mean that it must be dull, serious, or even preach a message. Political theatre can discuss anything in any way and it is important that we don’t categorise political theatre as just one thing. The first question people interested in making or studying theatre ask is ‘what is theatre?’ For me, the answer is inherently political. Theatre is bodies in a space in front of people and saying something. This, in my opinion, will always be a political act. It is about harnessing the agency to be speak – not always through voice – and to be heard. 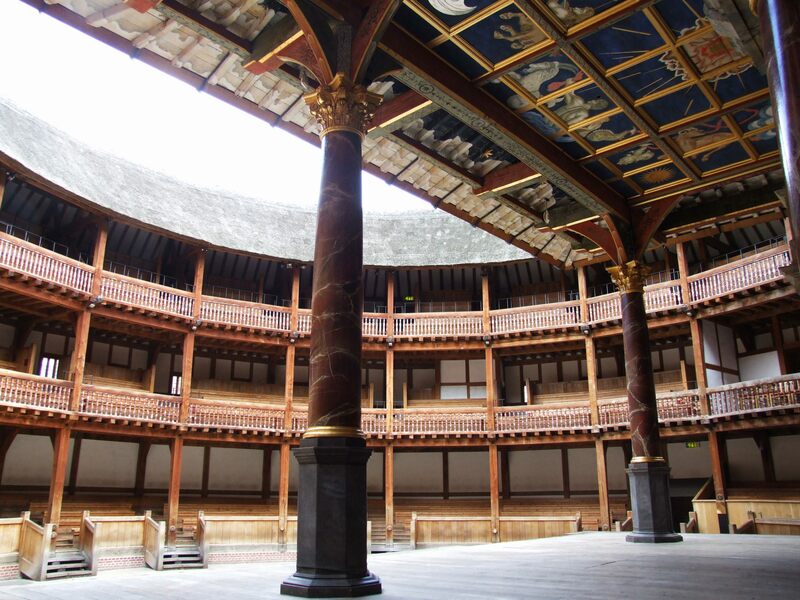 Theatres have a history of being extremely political places; they were the place of political debate for hundreds of years and were often banned because of their ability to offer alternatives to the dominant political views of the times. Theatres bring groups of people together to watch something in real time. They provide the space for alternative thought and discussion to take place. This is extremely political. Theatre provides the space to imagine alternative futures, possible solutions to political unease, to highlight social problems that are not openly discussed by mainstream media platforms – all done under the banner of art. It is through art that we are able to engage with politics in a different way that can open us up to new understandings and perspectives beyond our own. A good example of a performance that is political without taking away that ‘good night out’ vibe was Sunshine On Leith. This jukebox musical featuring the songs of The Proclaimers was created originally at Dundee Rep Theatre as a small-scale musical telling the story of two lads returning home from the Army to Leith, where they have to understand how, and if, they can fit back into their own lives. I saw the larger scale tour at The Kings Theatre in Glasgow, June 2018, and it had the atmosphere of any night at a big musical. No one was going to see Sunshine on Leith for its politics, they were there to chant along with ‘I’m gonna be (500 Miles)’ or ‘Let’s Get Married’. Nevertheless, the politics were there. Director James Brining and playwright Stephen Greenhorn deal with many political issues through the joyous 90-minute show in ways that are far from preachy, but an unassuming picture of real life for many young people. People are struggling to find employment in Scotland, whether it be after return from the army and ending up in a call centre, or being an NHS nurse that can’t make ends meet so resorts to moving across the globe in search of better opportunities. Going back to the example of Shrek: The Musical, and other big production musicals that litter the West End and the UK, it could be easy to assume that these are apolitical performances. They are made primarily as ‘entertainment for the masses’ and attract a much larger audience than smaller scale experimental work that we might then assume is more political. However, these performances still make a political comment simply by being a production – it becomes a comment on who is and isn’t able to attend these performances. The main barrier to these performances remains the high ticket prices and the tendency only to tour to large cities. Large scale musicals tend to tour to the large, old theatres that are in all major cities around the UK, and many of these buildings have a history of class divisions and elitism. For example, The Theatre Royal and The Kings Theatre in Glasgow have a rich history of class divide in seating. These gold-plated, red velvet lined auditoriums are reminders of a time in which theatre would be a place only for the rich and powerful. Although to an extent their audience is more diverse, ticket prices are still too high for many to attend regularly – theatres are still places that are not completely accessible for working-class audiences; the class-bias is still engrained in the pricing of large theatres. Obviously, this is not specifically about the theatre onstage but more about the industry of theatre that is, like many of the arts, still primarily focused on a middle-class audience that can afford to pay the high-ticket prices. This impacts the politics that will be shown on the stage. If theatre is being created for middle-class audiences then the politics will always implicitly reflect middle-class interests. It should be noted that many of the big musicals on the West End now recognise this and are taking small steps to combat it. Hamilton, The Book of Mormon, Aladdin and now The Lion King all have lotteries on the day of the performance, which offers winners the chance to purchase two tickets at a significantly reduced-price. This is only a limited number of tickets, but at least it appears that theatres are beginning to acknowledge the problem of many people being priced out. Everything is political. Everything has some form of political bias and theatre is no exception. No piece of work can ever be made in a political void. It is always about who has made it, who has seen it, and where it is performed and what is actually being said.